Woohoo! 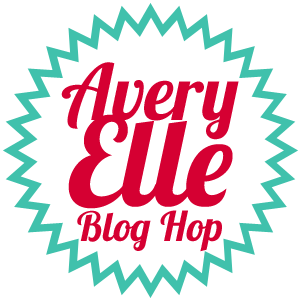 It's Avery Elle release time and this release is amazing! In addition to usual stamps and dies, we've also got new inks and papers! Today, I'm showing some projects using the new Homemade stamp and die set. This small set is centered around this cute little spoon! It's perfect for making little tags for homemade goodies. If you want to try the set in a different way, how about a get well card? I used the spoon with the stamps from another new set, Get Well. With that sentiment, how could I *not* make a shaker card;) For my "sugar", I used some coarse glitter. And don't you love the font of the "get well" sentiment? These are sooo cute, JJ! Love them! Oh how clever these are! I Facebooked, Tweeted and Blogged about the hop so others can enjoy this too. Your spoonful of sugar card is so clever and sweeeeeeeeet! that spoon shaker - brilliant!!! Thanks for sharing your wonderful cards. The spoon shaker made me smile. LOVE your spoon shaker card!!! Soooo clever! 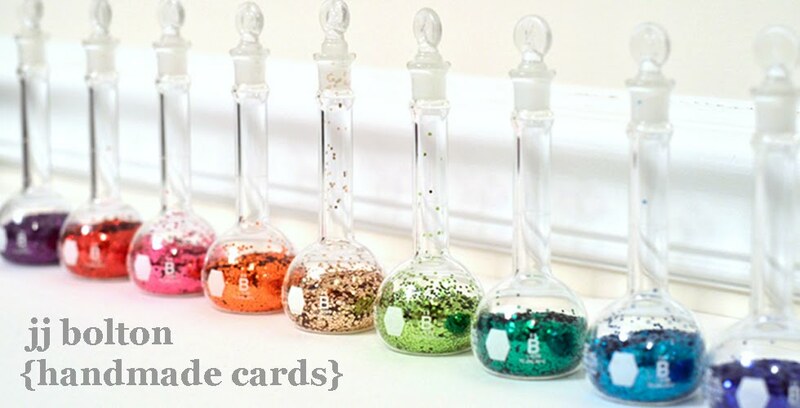 So smart to use glitter in the shaker card! TFS!!! The spoon shaker is so creative! Oh my! Wonderful cards!!!! That spoonful of sugar card made me grin! the 'sugar' in the shaker! I love, love,love the Spoonful of sugar card!! What a creative idea and so well-executed! Great card. That spoon is adorable. Very clever idea. I just love your rendition of a spoon full of sugar!!! Love the ice cream card. Such a great idea for a shaker card. I. Am. In. Love! The spoon get well card is the greatest! I love the shaker card spoon and the font on the get well stamp. The hearts on the second card are too cute. Such a clever cards... love it!!! Now THAT is a fun shaker card! Love your projects--love that spoon! Such creative cards. I'm lovin' the Get well with the sugar spoon. So many fabulous new releases! I love your cards and the shaker spoon is especially cute! love the spoonful of sugar, awesome!! 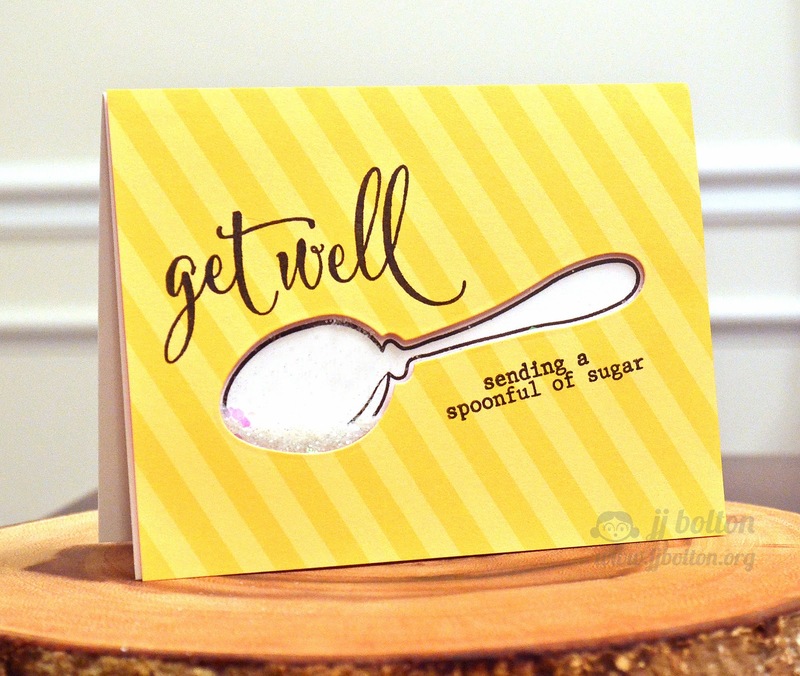 Cute cards and love the clever idea to make a get well card with a spoon shaker. I absolutely love the spoonful of sugar card!!! Love this as a shaker card! So cute! Thanks for sharing! You have been a busy girl. love the sugar spoon. Excellent idea. It would be good as a your so sweet thank you card as well. Love the spoonful of sugar shaker .... adorable! Love the spoonful of sugar! Too sweet!! Wow!!! Adorable spoon full of sugar card!! Very Sweet! Love the Get Well card! These are so fun! Love the spoonful of sugar! I really like your window card (get well) with spoon. Your second card is awesome as well, especially card stock color, beautiful! what an awesome sugar cut out card - shaka! Cutest spoon ever! Love your cards. You are so clever, JJ!!! Your shaker/get well card is so fabulous...it really makes me smile! Love how you stamped inside the aperture on the second card, too! Two awesome cards! Love, love, love these adorable cards! Clever ideas! The spoon die is a must have for sure. Love your spoonful shaker card, and that stamp set!!! Fun fun card! Love this new stamp! 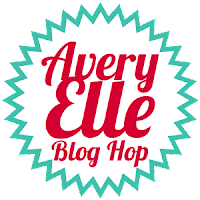 already a follower on twitter & tweeted the designer blog hop! already a follower on facebook and shared! already a follower on pintrest! already joined the flickr group! The sugar on the first card is so creative. Wow! What cute cards & love the font & sayings of this set! Love your unique takes on that spoon! Love both of your cards...love the shaker and I'd definitely use a spoon on a big 'ole cupcake! I love how you have used the spoon die! Such a creative way to use it and pairing it with the get well stamps, just brilliant! Such creative cards! Love the spoon shaker! So CLEVER... a spoonful of sugar. LOVE it! That is such a cute and clever get well card! Beautiful cards! 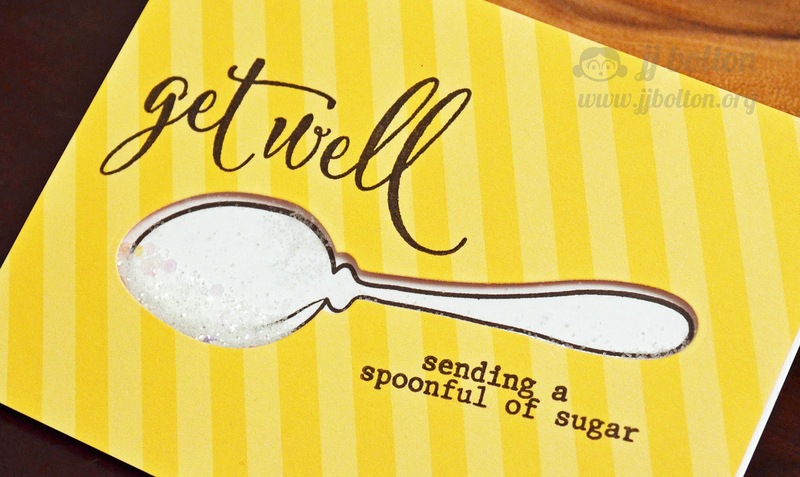 Love the get well card with the spoon die cut. Very creative! I adore your shaker card! So clever. Thank you! Your cleverness always makes me smile. Such a pleasure looking at your fantastic cards. Super cute cards - love the CAS look and the Spring colors. oh my gosh!! this spoon shaker is ADORABLE!!! love it!!! Two great cards; the get-well card is my favourite ! Super idea ! Oh these are cute! Love that spoon! Great get well card!! Love, love, LOVE the spoon full of sugar shaker! NOW that set's on my wishlist! Adore your spoonful of sugar! Awesome cards! I love your spoonful of sugar card, so fun! I love your spoon full of sugar shaker card. It's so simple but great. Thanks. cute cards. Love the spoonful of sugar. So creative with your spoon shaker element. I love your spoon shaker, such a clever and fun design. LOVE your spoonful of sugar ... I confess that I recently watched Saving Mr Banks, so the words are fresh in my mind, LOVE your cupcake-filled frame too!!! Awesome cards! 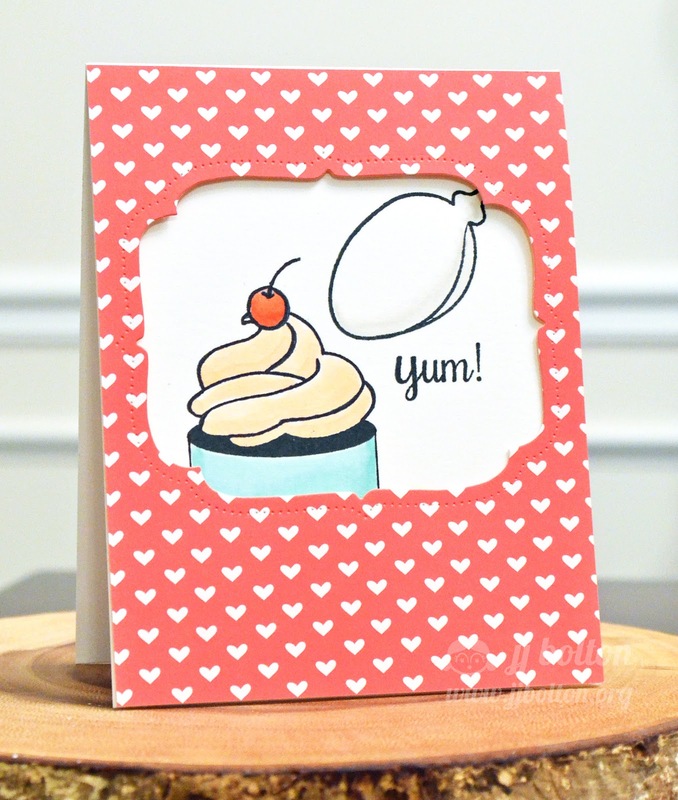 Love that shaker spoon idea, and the cupcake card with the pretty frame looks YUM! Love the spoon full of sugar card! Your cards are beyond AWESOME - they are amazing, incredible and stellar!! Such creativity and cool thinking!!! Way to go - I am so uber impressed!!! Hi JJ! I have missed your card making so much! Glad I've found you again. Love this spoon!! That spoon window is spoon swoon worth!! Briliant! Thanks, Paulette S.
as the email address Google is presenting for me on a blog that was closed in 2012 is incorrect. Oh wow such yummy cards and I am in love with the spoon shaker card so much. These are so cute. I agree, How could you not make that first card into a shaker card. I'm glad you showed me this Homemade set. Thanks. Oh I cannot even tell you how much I adore the spoonful of sugar that you have on your card!! Love this so much. And the happy yellow stripes!